Birthday Edition of 38 Things About Me.....with updates on last years list. So today is my 38th Birthday and boy have things changed for me since I turned 37. 1. I happily supported the move out of California to Texas, and have not regretted it once. 38. I'm celebrating my birthday this year a little differently, we went on a road trip last weekend, I'm getting a mani/pedi after work today and I have no other plans to celebrate with anything else since Waynerd has to work. Normally, I try to have a "God does not give you more than you can handle" outlook - but I have to tell you, the big man and I need to have a heart to heart. In my house, I live with my husband and 2 daughters, all three of whom have Type 1 Diabetes. Collectively, there are 15 shots a day, 14-18 finger pokes to check their blood sugar and constant adjustments to dosages. This is ALOT to handle everyday. Not to mention all of the extra drs. appointments, prescriptions and extra money that seems to fly out of our account every month for the "out-of-pocket" portion of the show. 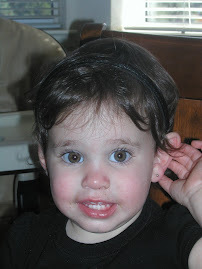 NOW, my youngest, Little G, is showing signs of Celiac Disease - where your body cannot tolerate gluten of any kind. It does damage to the stomach, the esophagus and can cause lots of problems if it goes untreated. We're hoping to get in for the bloodtests today, and of course we don't want bad news, but not knowing is messing with my mood (of course PMS isn't helping matters either, yeah for Mother Nature), my sleep and it makes me cry everytime Little G tells me her tummy hurts. Sorry for the rant, but I'm on overload right now and I'm a little overwhelmed.